It's not St. Patrick's Day until the Chicago River is bright green and every Irish pub has stocked up on green beer. I don't have an Irish bone in my body, but I definitely love the spirit of St. Patrick's Day. What's cooler than a holiday that embraces such a rich heritage? I'm totally down! Well, the green beer I can skip. The food, I embrace. This recipe is inspired by a classic St. Patrick's Day combination, corned beef and cabbage. Instead of corned beef, I used cubes of thick-cut ham since it has that saltiness that corned beef would bring. Instead of cabbage, brussels sprouts make a great substitute. The potatoes are just potatoes, ha! 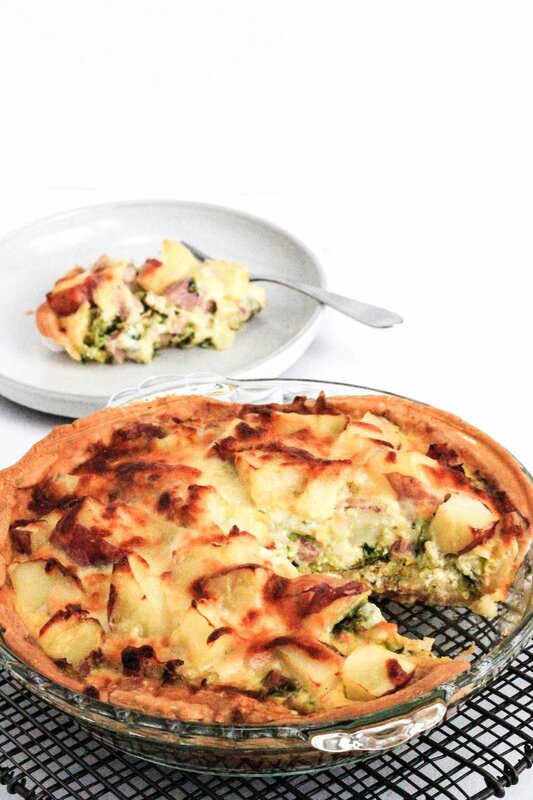 Everything comes together into a potato and ham quiche that'll get your St. Patrick's Day started right. Recipe is below! Roll your pie crust onto a 9-inch pie dish. Press the pie crust into the pan. Place another pie dish on top and bake the pie crust in the oven for 20 minutes. Remove the pie dish on top and bake for another 10 minutes. Set aside. Meanwhile cook the potatoes. Prick them with a fork on one side and microwave them for ~5 minutes until soft when pricked with a knife. Cube the potatoes and set aside. In a large pan on medium heat, stir the cubed ham and brussels sprouts until the ham is warmed through and the brussels sprouts soften. Set aside. Add the ham and brussels sprouts to the base of the pre-cooked pie dish. Add the potatoes on top. Whisk together the eggs, half and half, and a heaping pinch of salt. Pour this mixture over the ham and the vegetables in the pie pan. Top the entire dish with the shredded mozzarella. Pop the baking dish in the oven for 30-40 more minutes until the egg mixture is completely set and the top is golden brown. Dive in while warm!